We arrived in Paris last night after an overnight journey from Atlanta to Heathrow… British air was quite an impressive airline- feeding us dinner, free wine, and breakfast! We have two rooms at the Marriott Ambassador Opera Hotel, which is in a fabulous location- with a metro station one to the right and another one block to the left. 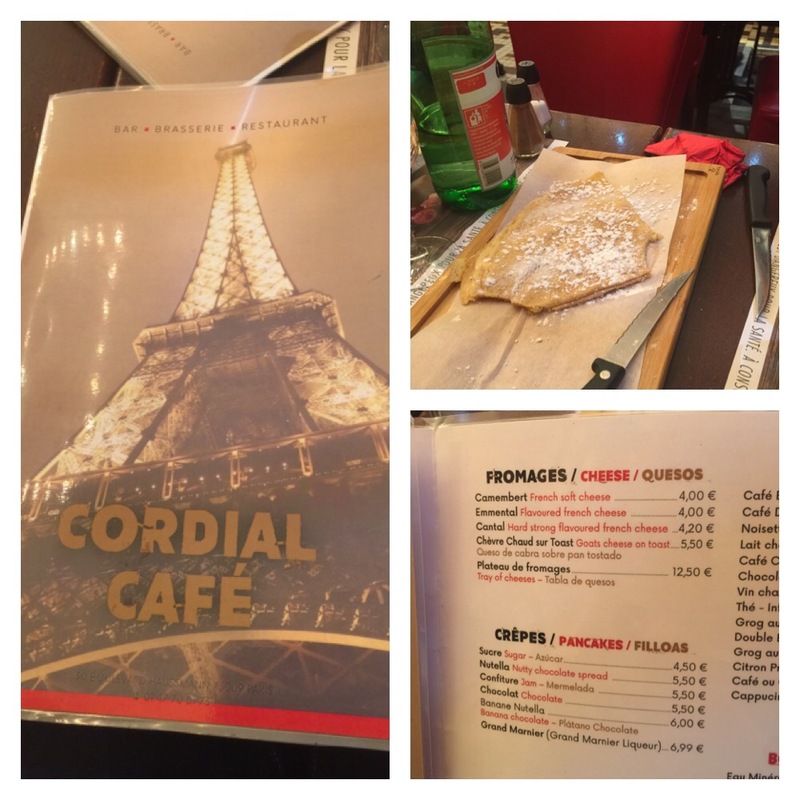 Our dinner last night was at a cafe down the street called the Cordial Cafe… the place had the perfect menu for our family of teenagers… burgers, crepes, pizza, French onion soup, and cheese! The family liked the Cantal cheese, but only I enjoyed the Camembert! Yummm! The waiter was full of good humor- for example, when we asked him to take a photo for us, he took the iPhone and put it in his pocket and pretended to walk away! After exploring the cathedral we made our way to the toilets (WC), where they charge one euro per person to pee. The line was 50 yards long by the time we left! 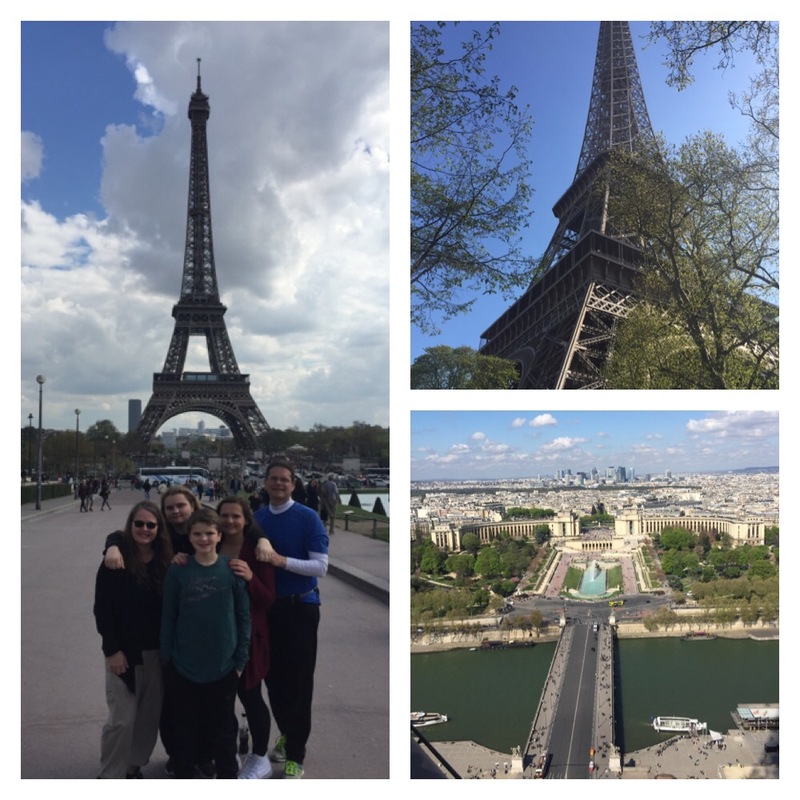 We walked from the Eiffel Tower to Trocadero- which is home to the Palais de Chaillot which was built in 1937. We stopped off at a local crepe stand to grab a quick lunch of French bread sandwiches and crepes, and sat down to eat on park benches outside of the Palais. We passed some local entrepreneurs who were “renting” opportunities to drive Lamborghini sports cars! Noah was chomping at the bit! We walked up and over the Musee de l’homme, (loads more stairs!) stopping to watch some street performers. 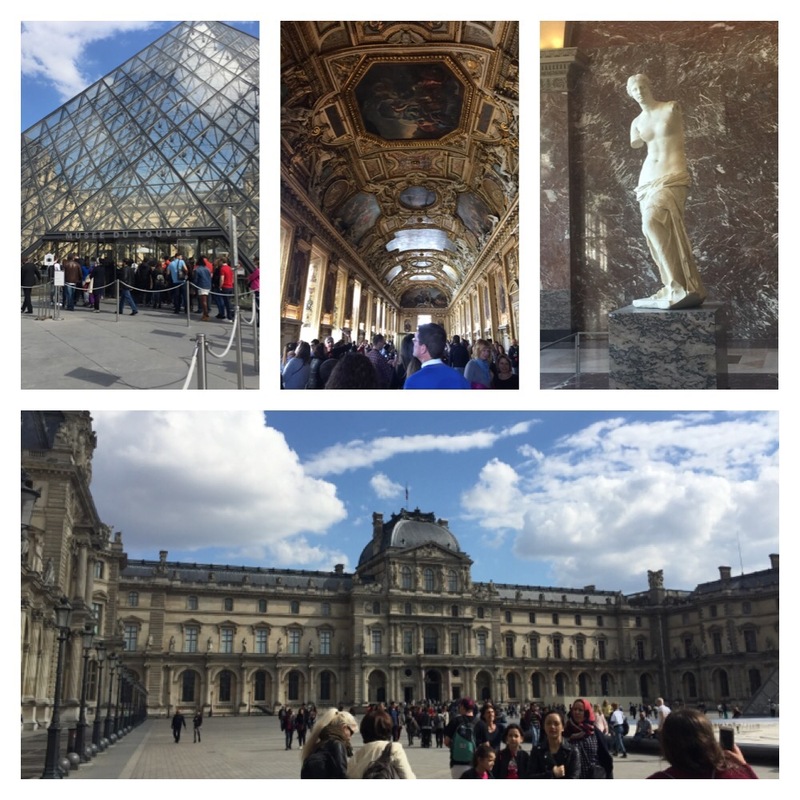 The next stop was The Louvre- where we were eager to spend a few hours exploring the paintings, sculptures and exhibits! The kids got in free, so we only had to pay for two adults, which was a nice surprise! 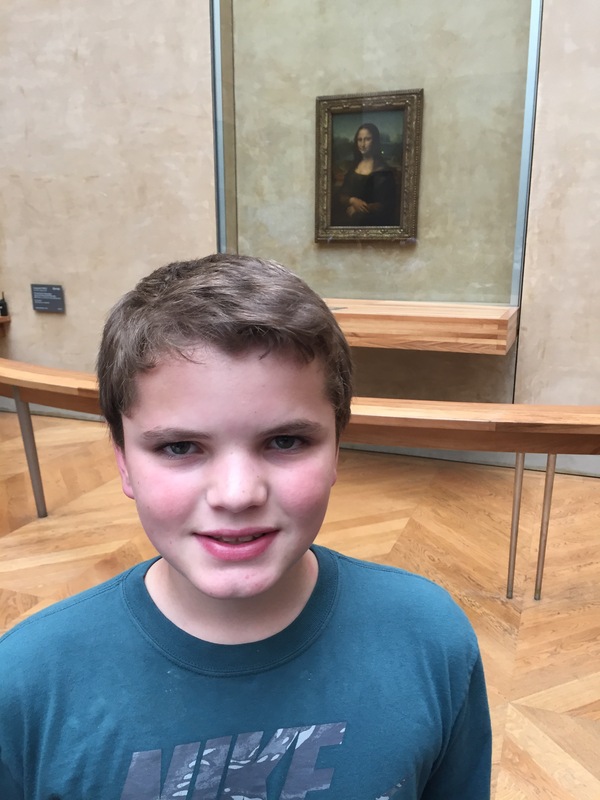 We were all blown away by the ancient art- particularly the Winged Victory and the Venus de Milo… Noah was ecstatic to have his picture taken with none other than the Mona Lisa! The Egyptian and Roman exhibits were fascinating- some of the art dating back to 4,000 years before Christ! 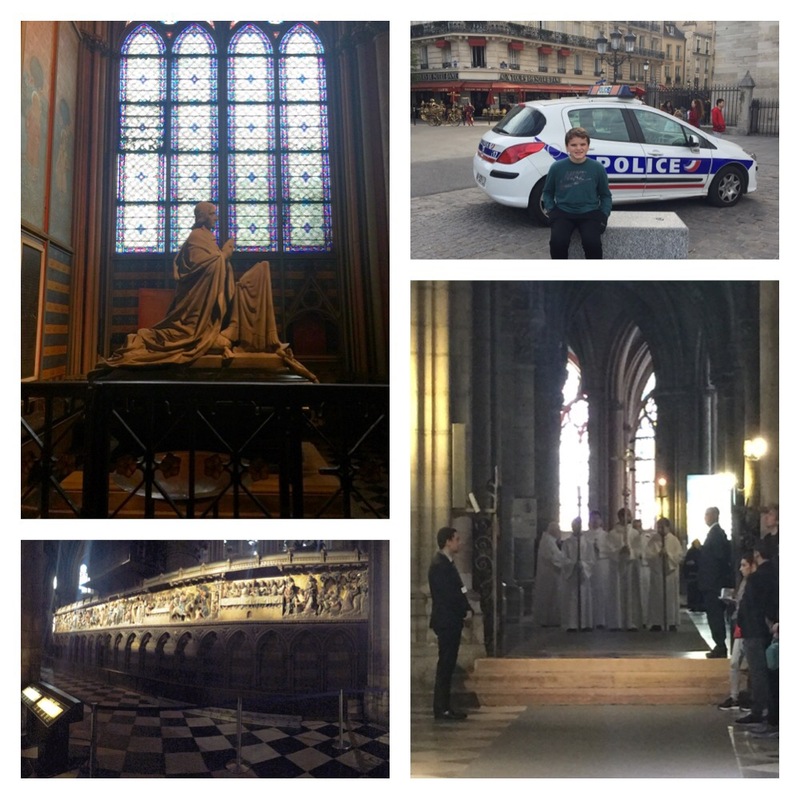 I was thrilled to wander the museum and its 30,000 works of art- as it was closed because of the floods when I was in Paris during the summer of 2016. 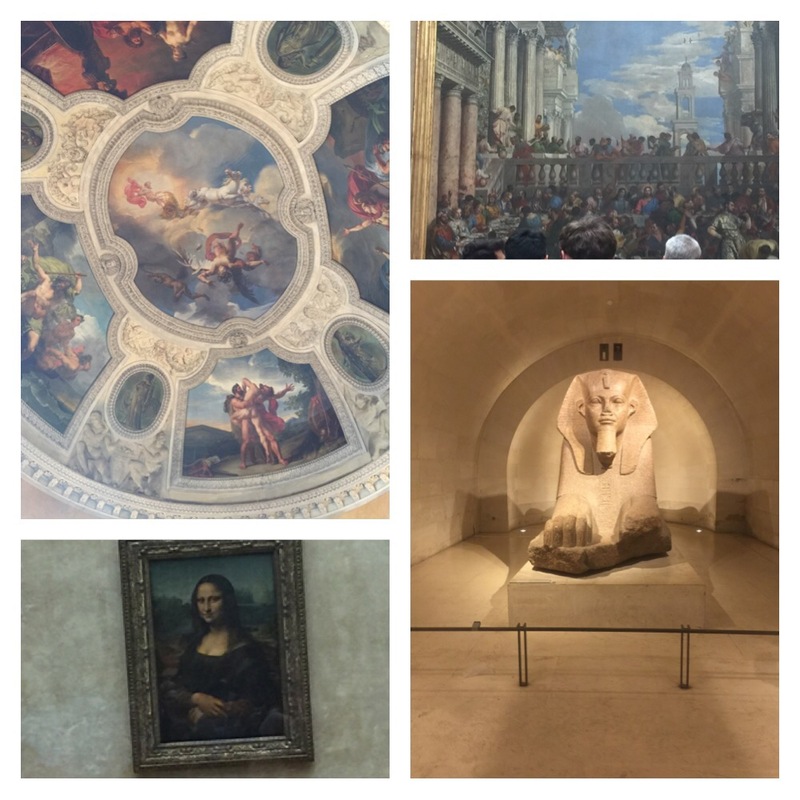 We walked a good percentage of the 200,000 square feet of the Louvre. The kids may even blushed at a few of the paintings which may have had rather “adult themes”! After closing down the Louvre, we made our way to Montmartre. Half took the stairs- half took the elevator up. 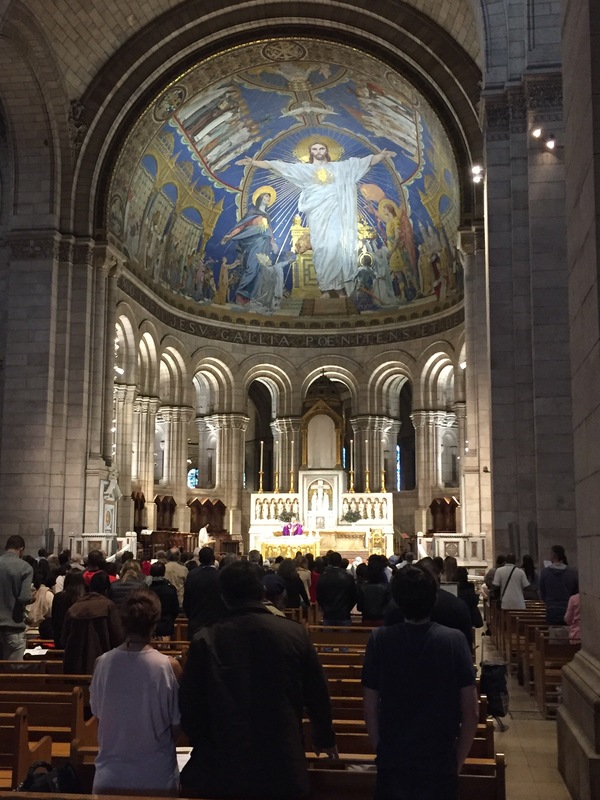 At the top, we enjoyed more gorgeous city views and more street entertainment before heading in to tour the Sacre Coeur Basilica built in 1873 to atone for the lack of religious faith typical of the century. The ceiling fresco upon entering the church is truly breathtaking. It actually makes you catch your breath. 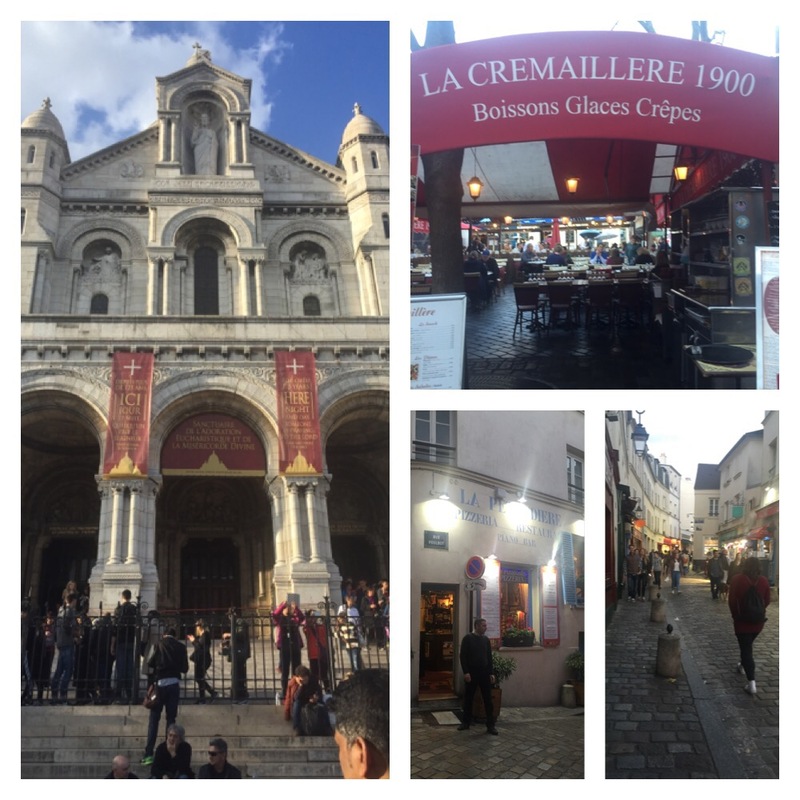 After wandering through the church, we wandered over to Montmartre. Here we wandered the shops and the kids used their own money to buy MORE Eiffel Tower trinkets… they just can’t get enough! We finally settled in to dinner at a restaurant right in the middle of the artists area. What a romantic place with local artists carrying on the tradition of their craft that began with great artists like Degas! 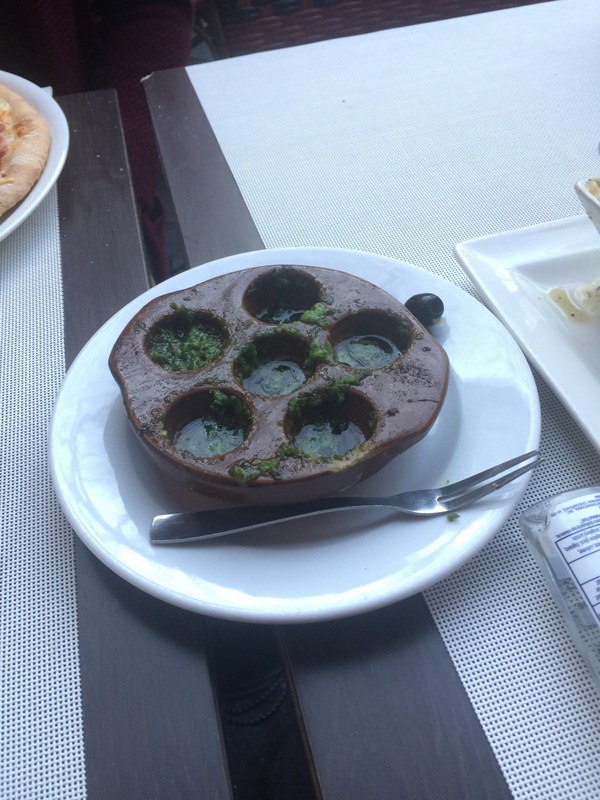 We ordered dinner and decided that everyone in the family would try a French tradition: escargot! I had fun talking with the The flavor at first was delicious, and I was relieved that they were cooked. When the pesto gave way to the actual flavor of the snail, however, my pallet wasn’t pleased…a strong taste of mud invaded! I wish I could have filmed Molly’s reaction! Haha! Thank goodness the French love bread! 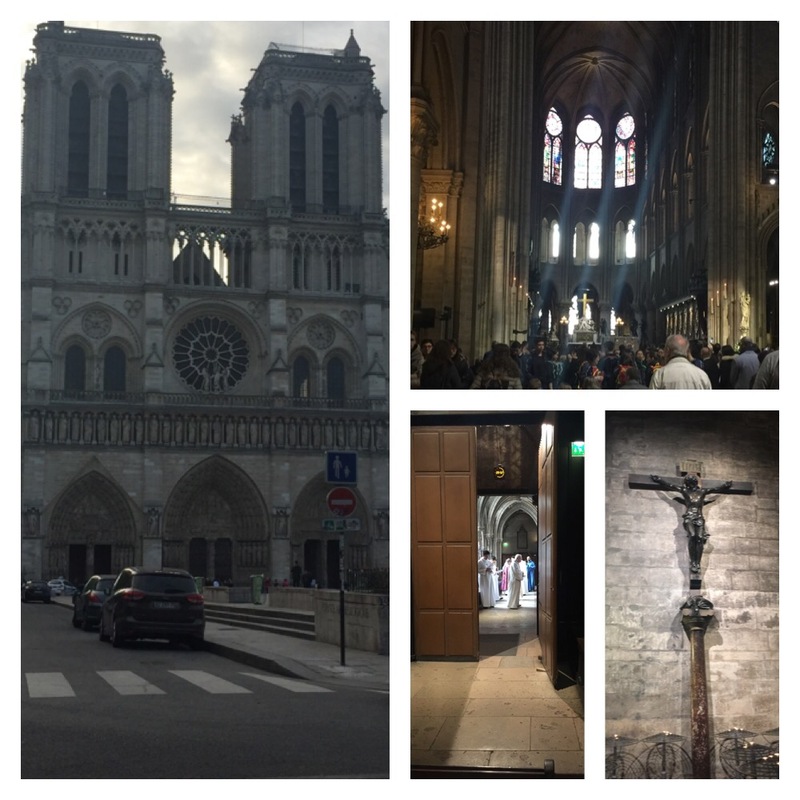 Heidi and family..as Rick Steeves always says, “Keep on traveling”—thank you for the great pix and commentary. I wish Nancy were on Facebook so she could see these. Will have to get my IPad over to her and share your journey. More blasted snow here for Tuesday/Wednesday. Your journey keeps me sane. Great intro to my favorite city! Wish I was there with you!